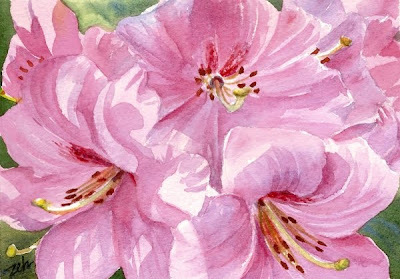 The sunlight makes patterns on the petals of these beautiful azalea blossoms. Such a gorgeous color, aren't they? To create the effect of sunlight, one needs shadow. There is no light without dark when it comes to painting. Since this is a watercolor, the light areas are left as a pale wash of color, then the darker shades are painted over them. This REALLY is lovely Janet - beautifully done colours. Thank you, Maree. This one just painted itself!